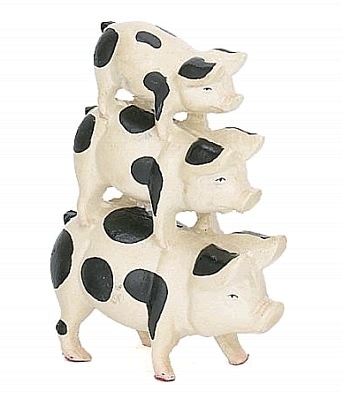 Even pigs love company and this cute sculpture of three little pigs one on the other is simply adorable! Created from cast iron, the pig figurine come in a color that is hard to miss! Hand painted. The ancient Greeks sacrificed pigs to various deities such as the Goddess of Agriculture and Fertility, Demeter, who ensured that the people received a bountiful harvest. Other Greek Gods and Goddess who received such sacrifice included Areas and Gaia. According to legend, Demeter also watched over the fertility of the earth and is the Goddess of the Sacred Law and the cycle of life and death. When her daughter Persephone was abducted by Hades, the God King of the Underworld, Demeter was besot with grief and began an endless search for her. As a result, the seasons suffered and death and destruction began. Seeing the chaos, Zeus who was also the father of Persephone, sent his messenger Hermes to the underworld to bring his daughter back and in so doing, restored life back to the world.